Response to the HS2 Environmental Statement in February 2014. Click here to read the section on Twyford. .
On Saturday 2 April 2011 around 25 people gathered at The Crown pub in Twyford. Half were local people concerned at the plan to route a 250mph rail line within 100 metres of the northern edge of their village. Half were members of the Buckinghamshire Archaeological Society, concerned at the likely effect the construction of the line might have on the historic landscape and buildings of the county. Their combined aim was to spend the day researching and surveying the old buildings of Twyford. Local people contributed not just their local knowledge but also documentary evidence from their attics, property deeds and old newspaper cuttings. 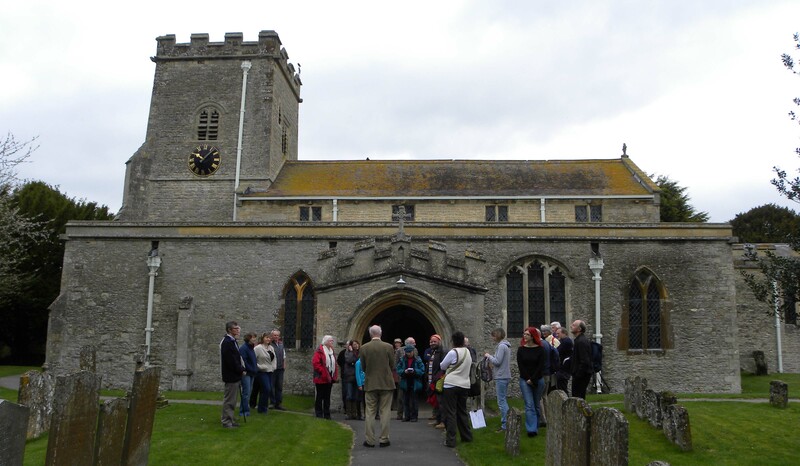 BAS members brought along their skills and experience in surveying and identifying the age of old and historic buildings. Some buildings were already known. The Parish Church of the Assumption, for instance, is a Grade I listed building with a splendid Norman doorway. If the line goes ahead, the church will be just 150 metres from the speeding trains. However, much of the village remained so far unrecorded. How old are the low earthworks in the field immediately next to the planned line? How many of the old cottages along the village high street date from the 16th and 17th centuries? How old is Portway Farm? The day started with a mass viewing of the parish church, led by historian John Brushe. The gathering then split into three groups to conduct house-by-house surveys, recording all buildings, old and new, on the north side of the village, which is closest to the Proposed HS2 line. Finally two smaller groups made preliminary surveys of St Mary's House, once the vicarage, and Portway Farm. This Research Day laid the foundations for further surveys and research over the following three months, mapping Twyford's historic environment and preparing reports on the village's historic assets, assessing the likely impact of HS2, and making recommendations. Each of the pages that follow provides a summary as well as an opportunity to download the full text of the report itself. Following the conclusion of the government's HS2 Public Consultation, new route maps for HS2 were published in January 2012 showing amendments to the proposed line. At Twyford the position of the line has been moved around 120 metres further away from the village.